And, are you going to bring snacks? It shows the probability of a prisoner being granted parole depending on when during the day his parole hearing takes place. 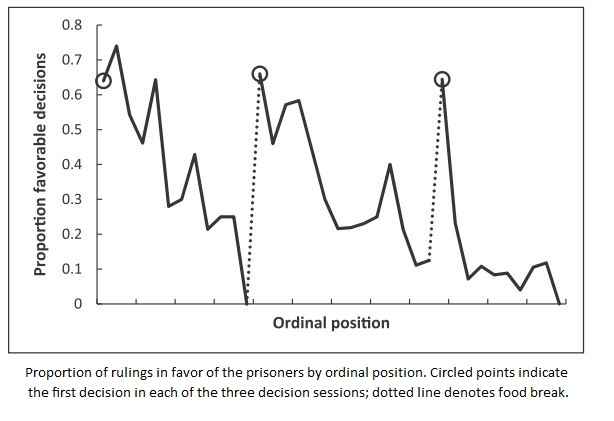 The dotted lines indicate when the parole board to a break for food. Ok, now: Schedule your next meeting. This entry was posted in Uncategorized on April 13, 2011 by bhyde. I guess you should schedule them right before lunch so people are hyper-critical to increase the ideas that bad ideas get shot down early. But the effect here is stronger. er, “the probability that bad ideas get shot down”. Stupid fingers. Posting with low blood sugar no doubt.